Arrowood LLP is a nationally-recognized law firm based in Boston, Massachusetts. Our attorneys are among the most elite and highly respected trial lawyers in the state. Arrowood LLP provides our clients with the flexibility and efficiency that only a boutique firm can offer. Material presented on the Arrowood LLP website is intended for information purposes only. It is not intended as professional advice or advertising and should not be construed as such. When you litigate and go to trial, you need lawyers who are not only committed to your case but who are also smart, experienced, creative and determined. Arrowood LLP understands that the best results are the product of a partnership, so we work with each client to develop and execute custom-built plans designed to maximize success. Lisa Arrowood was on the panel for Women Trial Lawyers at the Boston Bar Association. 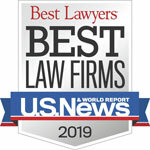 Arrowood LLP has been named a Tier 1 firm in Boston for Commercial Litigation by U.S. News – Best Lawyers® “Best Law Firms” in 2019.